The November 2016 Month of LibreOffice begins! Back in May we had a Month of LibreOffice, crediting contributions to the software across the entire project. It was fantastic, with hundreds of badges and barnstars awarded to developers, translators, bug reporters, and also to people who help with documentation, the Ask.LibreOffice site and social media. 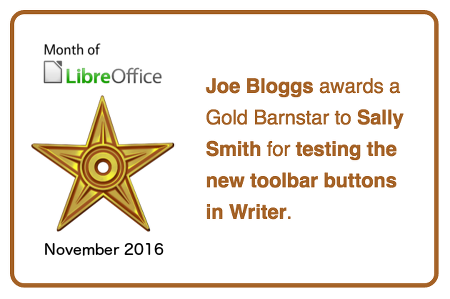 To award a barnstar, just email barnstars@libreoffice.org, say who should get it and what they did. We’ll then add it to the page. We’ll add every contributor to the list of badges on our wiki. Everyone who earns a badge can proudly show it off on their blog or social media accounts! At the end of the campaign we’ll make a high-score list for the contributors who earned the most badges. Contribute code: The codebase is big, but there are lots of places to get involved with small jobs. See our Developers page on the website and this page on the wiki to get started. Once you’ve submitted a patch, if it gets merged we’ll award you a badge! Translate the interface: LibreOffice is available in a wide range of languages, but its interface translations need to be kept up-to-date. Or maybe you want to translate the suite to a whole new language? Get involved here. Write documentation: Another way to earn a badge is to help the LibreOffice documentation team. Whether you want to update the online help or add chapters to the handbooks, here’s where to start. Answer questions from users: Over on Ask LibreOffice there are many users looking for help with the suite. We’re keeping an eye on that site so if you give someone useful advice, you’ll get a shiny badge to add to your collection. Spread the word: Tell everyone about LibreOffice on Twitter! Just say why you love it or what you’re using it for, add the #libreoffice hashtag, and we’ll award you with a badge. Can you get all six badges? Good luck! The campaigns run until the end of the month, so you have around four weeks to award barnstars (or earn them!) and pick up badges for your contributions. We’ll be posting regular updates on our Twitter account, and of course keep an eye on the wiki pages to see the progress. Stay tuned!